Description: #11 pushes the Vermonter. In a few minutes, the 11 will become the leader. Description: The Vermonter departs Palmer for Vermont. 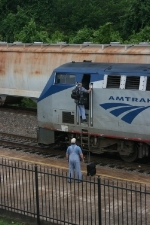 Description: AMTK 11 shoves an Amtrak shuttle toward the mantainence facility in New Haven. AMTK 101 and AMTK 108 rest quietly to the right. Description: This is the Palmetto, which originates at 8:00 am in Savannah. The person in the green shirt talking to the engineer is Phillip Shaw, a RR Picture Archives contributor, who is heading north. The car attendent of the first car is walking up, and the other person is unknown but just took a picture of the train. The conductor, who just asked for a brake test, is in the white shirt at the far end of the train. The train is in the north pocket of the station. The tiny black spots on the nose of #11 are deadbugs no doubt accumulated on Saturday's southbound trip. The mainline tracks are to the right of #11's snowplow on the embankment which reduces the chance of them being flooded. Description: the 80 rolls around the curve at the old North Carolina Finishing Company about to cross the Yadkin River. NS has just recently laid brand new rail that was made in 2006 that replaces the old rail that was left over from the Southern days. Description: A fashionably late 301 meets mkcvn. Description: P048-13, running late like he did yesterday, heads east past the GE plant where it was built. Description: P089-20 starts up after waiting for permission through the work limits. Description: 2 sweet rides left out of NOUPT today behind AMTK 11. Thanks to Shawn Levy for the I.D.'s! Williams Blvd in Kenner.